How Can You Save Your Bones? 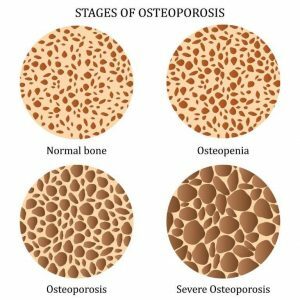 I was diagnosed with a precursor, osteopenia, at age 42, so it is not surprising that half of all women will have osteoporosis by age 60. One in five women will have a hip fracture in her lifetime, and 50% of them will never walk again. Men are not immune; 30% of all males have osteoporosis too. Many things can interfere with the development of a strong and healthy skeleton. Genetic abnormalities can produce weak, fragile bones, or bones that are too dense. There are many reasons such as nutritional deficiencies which can result in the formation of weak, poorly mineralized bone. Many hormonal disorders can also affect the skeleton. Lack of exercise, immobilization, and smoking can also have negative effects on bone mass and strength. External factors, such as diet and physical activity, are critically important to bone health throughout life and can be modified. While adequate levels of minerals can be obtained from the mother during pregnancy and nursing, they must come from the diet thereafter. 11 things can you do in the meantime…. 1. Reduce your bad stress (we all need some stress in our life) which raises cortisol levels that can have a negative effect on your bone health over time. Cortisol aggravates insulin and leads to insulin resistance, eventually raising the blood sugar and causing calcium loss in the urine. 2. Relax more by improving your breathing through meditation, yoga, tai chi or get a massage. 4. Consume less protein because excessive protein can cause excess acidity which affects how we metabolize calcium, which is excreted in urine. The opposing challenge is for those who take acid reducing medications and still need a certain balance of acid in their stomach to help absorb important minerals such as calcium, magnesium and zinc. 5. Caffeine in coffee may offset other conditions, but whether you consume caffeine or decaf, it cuts the calcium in your diet. Tea is a better solution and more flavorful. 6. Talk to your doctor if you still need to take a calcium supplement because a study in 2015 concluded that the use of calcium is not 100% proven to help with reducing bone fractures. 7. Get your D3 levels checked. Vitamin D helps to absorb calcium which can also be important for your immune system and depression. 8. Have your hormones checked because both men and women need adequate levels to maintain bone health. 9. Reduce the amount of refined sugars and starches which can also elevate your insulin levels and cause an increase in osteoporosis. The ideal diet is called a “low glycemic index”. Glycemic index is a measure of how quickly food turns into sugar in the bloodstream. Low glycemic index foods do not raise blood sugar or insulin levels quickly. 10. Increase your fiber intake. It is an easy way to lower sugar and insulin levels. Fiber taken just before meals helps to slow down the absorption of sugars and fats, and can help lower cholesterol and blood sugar levels, as much as medication. High fiber fruits include avocados, Asian pears, berries, coconuts or fresh figs. High fiber vegetables include artichokes, peas, okra, acorn squash, brussels sprouts, turnip, beans and legumes. 11. Exercise more! When the muscles pull against the bones during exercise, it stimulates the bones. Any weight-bearing exercise such as walking, hiking, climbing stairs and weightlifting can increase bone density. As little as 15 to 30 minutes a day can be helpful. Weightlifting does not need to be with heavy weights either, it can be with as little as two – to five-pound hand or ankle weights. Or you can use your own body weight and let gravity to do the job. Weighted belts can add resistance and can be adjusted for comfort. Exercises such as swimming and cycling, though great for cardio strength and overall fitness, ARE NOT weight-bearing, so aren’t the most beneficial for your bones. Stay current with the research, eat well and keep moving.